Southern Ontario can get awfully sweltering in the summer. Depending on where you live, you can easily reach temperatures of 35 C plus humidity... it makes one sweat just thinking about it. 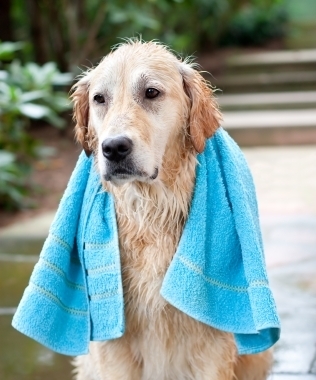 When the weather gets really hot, it’s a good idea not to have your dog exert too much energy outside as it can lead to heat stroke and dehydration. Your pup does, however, still need their physical and mental exercise all the same. Starting a stairs routine with your dog can be both fun and a great exercise for your pet! Toss a toy down the stairs and have your dog fetch it back to you, then repeat. An important note, however, is to not play this game with elderly pets, puppies or those with hip/joint problems. It’s like going for a walk, but inside! If your dog loves their daily walk and the routine in brings, try this out on the days that it’s too hot or the weather is poor. It may brighten up their day more than you expect and they’ll come back for more. Who doesn’t love a game of Hide & Seek? This game can be played by hiding treats, or with people as the lure. Another method would be to hide various toys around the house and build them up to fetching them one-by-one as you call them by name. This one’s pretty simple to play, all you need is 3 cups and a few treats, and you place the treat under one of the upside down cups before shuffling them about. Your dog should follow their nose and use their brain to sort out the location of the morsel. Most people associate the Laser Chase with cats, but dogs absolutely love it too. Get a cheap laser pointer and shine it on the floor, wiggling it about the room. Not only will your dog have riots, you will probably cry laughing. Have fun with your dogs this summer, inside and out, and for other inside exercise tips, contact your veterinarian today!